Located in Woking JDS Compressors Ltd supply, install and design a wide range of compressed air systems in Surrey and the southern counties. From the supply and installation of air compressors in Surrey to associated pipework and maintenance, JDS Compressors Ltd work with you to expand your existing compressed air systems or design larger bespoke compressed air systems to suit your business needs. JDS Compressors Ltd provide air compressors in Surrey & the UK, as well as carrying out a wide range of air compressor services including air compressor repairs in Berkshire, air compressor maintenance in Woking and air compressor servicing in Guildford, Surrey & across the southern counties.. If you need bespoke compressed air systems in Surrey or anywhere south of Birmingham, please contact JDS Compressors Ltd for a free quotation and one of their highly trained engineers will be happy to help. 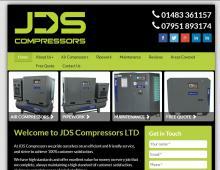 JDS Compressors Ltd are specialists in the supply, installation & repair of air compressors in Surrey & across southern England.